There's probably nothing in football which better articulates the maxim, it's the hope that kills you. So often, they're an unedifying spectacle placing disproportionate pressure on hapless keepers and hatchet man defenders. Ten minutes of drama at the end of two hours of red blooded commitment can render it all meaningless. And yet, the much criticised penalty shootout does more often than not, solve stalemate satisfactorily. It's rare indeed spot-kicks go the way of the undeserving team. 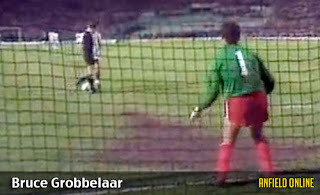 Arguably the penalty shootout's funniest moment! I can only think of two unjust outcomes: when Argentina did for the host nation at Italia 90 and ironically, when the Italians did the same for the homers, Holland at Euro 2000. What goes around comes around! 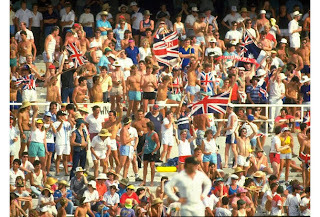 But as England fans, we are better qualified than most to judge this way to settle a score. 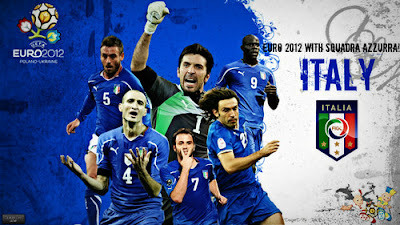 Few would argue the right team won as Italy advanced to the Euro 2012 semifinals at our expense. In their Euro semi, Portugal defended manfully but Spain created more potent chances and produced greater goal threat. Pouting, posturing Cristiano Ronaldo should've stepped up to the plate earlier, but it was all over for him when Bruno Alves skied a clumsy belter against the crossbar. Ronaldo will regret his international career if he doesn't already. Vainglorious dufus. Even Chelsea, the pragmatic, defensive away side in the Champions League Final, kept their nerve from twelve yards against a Bayern Munich side who misfired - and not just during the shootout either. Munich played with the weight of history on their shoulders, while Chelsea's thirtysomethings summoned their group experience and deserved victory when it came from the spot. Gareth Southgate's Euro 96 moment. As I write this, a correlation's emerging between being home team and losing spot kicks (although Liverpool deservedly beat Roma at the Stadio Olimpico to win the European Cup). 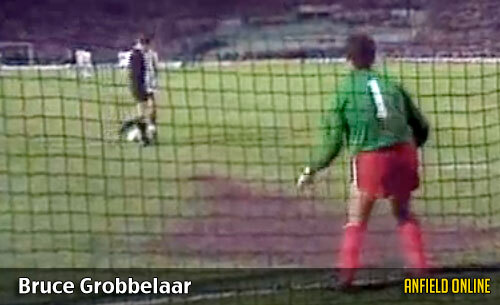 But penalties sometimes overshadow a contest, particularly if there's a mismatch. Greece knew full well there'd be a winner on the night as they squared up to the overwhelming favourites, Germany. Knowing the prospect of pens lay at the end of a hard shift, they showed scant attacking ambition to achieve anything in 120 minutes. Luckily, they were punished by four German goals long before they could get over the line. And I sense Roy Hodgson sought too much succour from Chelsea's Euros in preparing England to be hard to beat in theirs. It was good enough to dispatch Ukraine and Sweden, but could never stack up against nations of the first water. Italy spared us the ignominy of another German thrashing. So even though Sepp Bellend Blatter's floated a notion of alternatives to penalties, I reckon it's not such a bad way to find a winner. Golden and Silver Goals have come and gone, but the shootout remains as the way to sort the winners from the losers, and that's football. England bow out of EURO 2012 at exactly the stage Roy Hodgson anticipated. Outclassed during most of 120 captivating minutes, it's Italy who'll go forward to face Germany in the semi-finals. The game descended into a goalless war of attrition as Italy's passing and possession forced England into a rearguard action. Pirlo crowns Man Of The Match with cheeky pen! The first-half would've been the time for England to score and assert their authority on the game, but it wasn't to be. With Andrea Pirlo orchestrating midfield, Italy created chance after chance. Even Mario Balotelli played with discipline and resolve. Talk of mini-explosions and tantrums proved fruitless for the baying English media. The Italians did score through Nocerino, but he was ruled offside. They'd have deserved it but manful England defended doggedly, managing to get over the line for the penalty lottery. Sadly, it's never a competitition for England. We always go out of tournaments on spot-kicks - and despite the preparation Joe Hart and others insisted they were ready for, the cheekiest of Pirlo chips helped secure a 4-2 win. The England manager insists he's no regrets and the team can keep heads held high without a single "What If" to keep them up at night. But there were some distinctly ordinary performances out there led by Ashley Young, who surrendered possession too much and Wayne Rooney, who was completely beyond the required match fitness needed. On the positive side, Glen Johnson produced his best performance in an England shirt to date and John Terry, Joleon Lescott and Ashley Cole will all know they were in a real contest. We also have in Hodgson the new head of a settled regime ready for our next disappointment, the World Cup in 2014. It's now 48 years of hurt - and counting. It's Italy next for hopeful England. What are our chances? England have made it to the quarter finals of Euro 2012, winning the group with two wins and a draw. Let's keep our powder dry, we're English, FFS! England rode their luck en route to a 1-0 win over host nation Ukraine, including a "goal" for the host nation which should've counted. John Terry's athletic last ditch clearance was in fact over the line. But Ukraine are out. Wayne Rooney marked his return from suspension with the winner from a Steven Gerrard (who else?) cross. It was a tap in but an important boost for the Manchester United striker, who huffed and puffed his way through a first outing for five weeks. He looked off the pace for long periods but has an inner determination to overcome his blatant lack of match fitness. He found his feet towards the end of the match, but will certainly feel the effect of the workout tomorrow. Keeper Joe Hart was on top of his game and had to be, staying alert to the most determined of Ukrainian strikes, but special mention goes to the skipper. Gerrard has been magnificent this tournament. He's responded to wearing the armband with aplomb. Twelve years ago, I witnessed Liverpool's highly-rated youngster make his debut, also against Ukraine. Years later, now skipper, he stands up as our most important player. Some say we over rely on the set-piece for our goals and creativity: if so, who better than the artist Gerrard to conduct our progress? In winning the group, we avoid defending champions, Spain. That fate befalls the French on Saturday night. Instead, it's Italy on Sunday who like England, arrived at the tournament with low expectations despite the reputation of a first rate nation. John Terry, who'll always assume a form of captaincy whether wearing the armband or not, huddled the team together at the final whistle. Difficult to beat and united in purpose, England have a chance to make it to the semifinals. Then again, so do Italy. We must remain resolute and concentrate hard. Our dreams of winning can end in a heartbeat. England aren't the finished product by any stretch, but as John Lennon said "life is what happens to you while you're busy making other plans". We've more than a fighting chance of going beyond expectations and this is a vast improvement on Capello's South African flop. Roy Hodgson's called everything right. It's as if being overlooked for the job too many times has prepared him even more so. Doesn't he look so much the better choice than Harry Redknapp now? I suppose we shouldn't grumble at winning 3-2, but I hope lessons arising from this lacklustre game aren't lost in the afterglow of victory. We can't win Euro 2012 playing like that. When the press reported England's desire to attack and skipper Steven Gerrard declared the Swedes weren't as good as France, I sensed danger. And so it came to pass. The gameplan was ripped up soon after the restart as Sweden equalised a first half header by Andy Carroll. England didn't seem to budget for Sweden's do-or-die approach: if they didn't get anything from the game, they'd be going home. I've said it many times. The Premier League wastes so much of the valuable resource of older players in its relentless hunt for youth. This time it was to be costly for England as ex-Villa ace Olof Mellberg terrorised our defence with a hand, head and boot in both Swedish strikes. To fall behind with half an hour left was clumsy. Luckily, we have experience even in our young players. Walcott came off the bench, scored one and set up the other for Welbeck to turn the game around. The Arsenal player exorcised bad England memories of the past with his display. 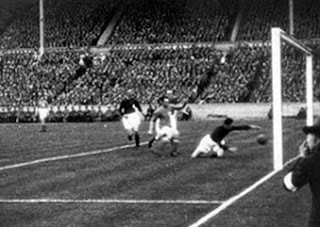 All three England goals were superb: Carroll was selected precisely for his physical presence: we needed someone upfront as big as the Swedes were! A real battering ram and he enjoyed himself in the role. Walcott looked surprised that his long range shot looped in: it even wrong footed their keeper, Isaksson. And Welbeck cleverly used his body to shield the ball from the close attentions of the defender, audaciously backheeling the winner. Another goal and we'd have topped the group and England tried to get it. That perhaps was gung-ho as we surrendered possession all too often when we should have defended our slender hold on a shapeless game. So England need a point against Ukraine to reach the quarter finals. I don't want to sound dowdy but we must remember our drills and maintain more discipline. Any team we face in Europe could bury us in a heartbeat. So let's use Ukraine to develop our flow and secure a result on firmer ground. Wayne Rooney's back too. Come on England! England's opening match in the Championship, a one-all draw with France shows us the pragmatism that Roy will deploy against quality opposition. France will be around later in the tournament, but the England boss knows we'll have to play to our strengths if we want to be there with them. City Slicker beats City Slacker: 1-nil England! The draw extended France's unbeaten run to 22 against an England boss with just three matches and ten training sessions under his belt. Sure we surrendered territory at the end of each half. They're practiced, experienced, continuous, confident and very, very good. But England's hard workers didn't flinch, and when French relentlessness opened us up, there was Joe Hart to quell danger wholeheartedly. This is going to be a recurrent pattern for Roy the realist, who's track record of producing difficult to beat sides must be how it is until we grow to his ultimate gameplan. And it's not all pie and mash football: Roy's willing to pull a few rabbits out of the hat too. He's sprung surprises with his selections and has the unknown quantity in the back of his mind: Oxlade-Chamberlain and Welbeck showed that. Hodgson's right; we will get better, but while we're not, this England fan would rather us win then go home with the tabloids screaming down his neck. It's Sweden and Ukraine next - neither of them strike fear into our hearts. Come on England and well done Roy's boys. On the eve of EURO 2012, I've made a 15-minute podcast on Italian football. In the show, I talk to reporter Tommi Mattei from the Italian squad's base in Coverciano ahead of their departure to Poland and Ukraine, there's also an interview with Italy coach Cesare Prandelli as he outlines his hopes for the tournament and we gauge his opinion on Roberto di Matteo's remarkable Champions League win with Chelsea. I'm hoping to get a sponsor from this so if you like it, please leave a comment and Share! Thanks. Marcus Stead is a lifelong Cardiff City fan. Like many Bluebird traditionalists, he's outraged at the decision to change the kit from blue to red next season. Here on Soccermongery, he discusses the background to the club's recent history. Traditions are like trees. They take years, even decades to grow and develop, but can be destroyed forever by one quick act of vandalism. For this reason, Cardiff City fans, and indeed the football community in general, should be extremely concerned by the announcement that the Bluebirds are no more and in future, they’ll be kitted out in red. 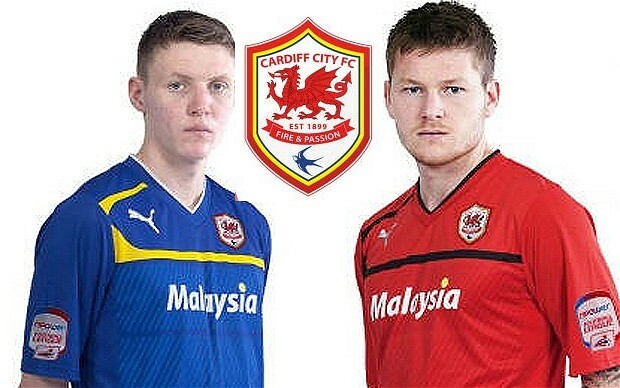 The concept of Cardiff City playing in red is as crass and as out-of-place as blue London buses or a bride walking down the aisle in black. It’s worth taking a moment to look at what has led to this announcement, and what has actually been promised in return for the change. The club has massive debt problems, which date back to Sam Hammam’s time as chairman, which began at the end of 2000. At the time, as a 16-year-old, I felt like the only person in Cardiff who had reservations about this man taking over the club. For me, he conjured up memories of Wimbledon ending up homeless for years, which eventually led to the club relocating to Milton Keynes. There was also a nasty edge to the ‘Crazy Gang’ culture at Wimbledon, which Hammam embraced and encouraged. I was concerned about what he had in store for Cardiff City. When he arrived at Cardiff, it didn’t take long for Hammam to show his true colours. Characteristically, he sucked up to the club’s hooligan element, which led to the disastrous events that marred the club’s FA Cup third round victory over Leeds Utd in January 2002. I was in the audience of ‘Any Sporting Questions?’, coincidentally held in Cardiff a few days later. The hooliganism was the main topic, while the astonishing Cup win was barely discussed. Furthermore, the way Hammam ran the club was absurd from the start. He spent cash to get the team out of the lower divisions, knowing full well that it would cost the club more every year than it was actually bringing in. He anticipated losses of between £1 million - £1.5 million each year. He wrongly believed that despite losing money each year, the building of a new multi-million pound stadium would result in new assets being created, both on and off the pitch, which would in time swallow up the debt. In fact, the losses were far higher than Hammam anticipated, totalling somewhere between £3 million and £4 million each year. The club were borrowing, through Hammam, from Citibank, who wanted their money back. To prevent the club from going under, Hammam set up a hedge fund called Langston to take on the debt and purchase the loan notes. It’s very unclear to what extent Hammam is in control of Langston but he has certainly acted as a mediator between them and the future owners of the club in the years since. Hammam’s financial planning for the club depended on him being granted permission to build the new stadium, but Cardiff Council did not do this at the time due to concerns over financial security. With the club’s finances in a mess, Hammam interviewed three people for the position of financial consultant, one of whom was Peter Ridsdale, a man experienced in running, or more specifically, ruining football clubs. In the previous few years, Ridsdale had taken Leeds Utd and Barnsley to the brink of disaster. It quickly became clear that Ridsdale and Hammam had very different visions, and, after a bitter boardroom meeting, Ridsdale’s company, PMG, effectively took control of the club. When and how Langston would receive their money has been a contentious issue that has held the club back ever since, with near-constant threats of court cases, winding up orders and possible takeovers. The debt owed to Langston is estimated to be worth around £31 million. Ridsdale was a nightmare chairman in a different way. He flirted with disaster while trying to build up a promotion-winning side. In other words, he was behaving in a similar way to his time at Leeds. Most Bluebird fans' worst nightmare. During his three-and-a-half years as chairman, the club fought off four separate winding up orders. He also lied to fans when, at Christmas 2009, he offered season ticket holders the chance to renew for the following campaign at a discounted price, with the promise that the money raised would be made available to then-manager Dave Jones to spend on players. It turned out that Ridsdale instead spent the money on repaying debts. When Ridsdale left the club in May 2010, the club was estimated to have £30 million of debt. On 16 June that year, the club faced a fifth winding up order over a £1.9 million unpaid tax bill. In fact, the debts were far, far worse than Ridsdale was letting on. Accounts for the year 2009, released in August 2010, showed that the club’s actual debt was £66 million. The Malaysian consortium, headed by Dato Chan Tien Ghee, paid £6 million for a 30% stake in the club that summer. This payment was clearly only a fraction of what was needed to put the club on a stable financial footing. The ‘front man’ for the Malaysian consortium is billionaire businessman Vincent Tan, who has built up a vast empire in his home country, with interests ranging from golf courses, a gambling company, and a pay TV outlet, as well as having close links to the extremist former Prime Minister of Malaysia, Mahathir Mohamed, who has a long track record in vile racism and human rights abuses. The new owners wasted little time in making it clear they had little interest in the club’s heritage. 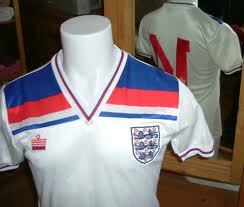 First to go was the small Welsh flag on the back of the shirt, which had been a permanent presence for some years. Can anyone REALLY imagine a potential supporter in the Far East being put off by the presence of a tiny Welsh Dragon on the back of the shirt? Is it that much of a marketing disaster? Try telling that to the owners of the Mumbai Indians, an IPL franchise that was created a few short years ago with the aim of having a global appeal. Next, the word ‘Malaysia’ became the club’s main shirt sponsor. The fans were willing to put up with this, taking a pragmatic approach that if this was what was needed to put the club on a secure financial footing, it was a price worth paying. However, it wasn’t long before the next financial crisis loomed. With the situation with Langston still far from resolved, there was more bad news when it was revealed that around £175,000 was still outstanding to Motherwell relating to the transfer of Paul Quinn. Half the money was paid off, with the rest still outstanding, as far as is known. The plans to completely re-brand the club were first leaked last month. The deal, as reported at the time, would see the club’s debts paid off, or at least better controlled, with £100 million made available to manager Malky Mackay. Supporters were in uproar, and the plans were dropped within a few days. Of course, £100 million is small change by Premier League standards. Once it had been spent, that would have been that, and no long-term plan was in place to keep the club on a secure financial footing. There is no £100 million spending spree being promised this time around. The wording of the news release is interesting. It says: "As part of this commitment, funds have been earmarked to finally resolve the historical Langston debt issue which for so long has cast a dark cloud over the club and its future. "Negotiations have been continuing and a final offer has been made to those representing Langston and [former club owner] Sam Hammam which we believe is both fair and reasonable." “The club plan to invest in a new training ground and facilities, and will look into the feasibility of expanding the stadium. "Our investors have also fully reaffirmed their support to enable [club manager] Malky Mackay to strengthen his squad for the season ahead in line with the viable and prudent budgets agreed with him." The rest of the press release is so full of platitudes and clichéd that it is not worth repeating on here. There are no concrete plans in place. Absolutely nothing has been guaranteed. It’s carefully worded, and is full of phrases like ‘plan to’ and ‘look into the feasibility of’. Furthermore, what happens if Langston and Sam Hammam reject the offer that has been made to them? I also can’t help but think back to that excellent Channel 4 ‘Dispatches’ documentary that was broadcast last year, titled ‘How to Buy a Football Club’. The formula was relatively simple to understand: Buy a club with potential at Championship level, sometimes lower (Leicester City and Cardiff City’s names featured prominently), get them promoted to the Premier League, and sell them on at a huge profit, with scant regard for the club’s finances or long-term future. It would be wrong to assume this is the agenda of the Malaysian investors, but we do have to ask why they were so interested in the club in the first place. Much as I hate to say it, the club does not have the prestige of, say, Manchester United or Liverpool. Cardiff City have not played in the top flight since 1962. Furthermore, Cardiff is not a ‘global’ city in the way London is. 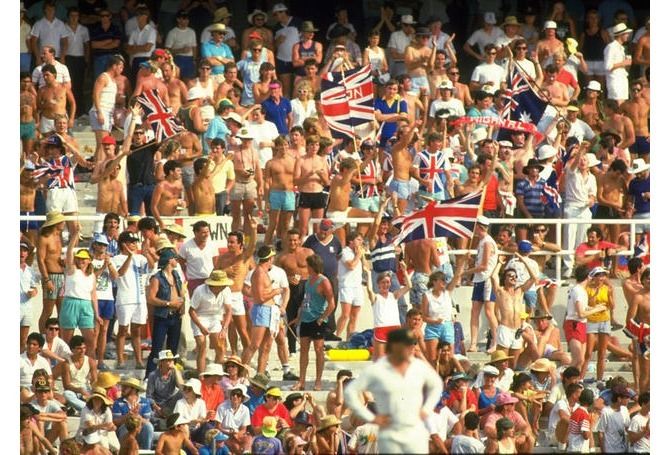 It is only really recognised by the general population in countries that have a strong rugby union heritage, because of experiences at the Millennium Stadium or the old Arms Park. Those who support the change to red state that there is no alternative but to go along with whatever the Malaysian owners want if the club is to have a future. But this brings into play a wider issue – the state of football in general. The truth is that, in 2010, 60% of English professional football clubs were insolvent, including some in the Premier League. The owners of these clubs are cheating. If you can’t pay your bills, that means you are insolvent. It is a criminal offence for directors of companies to trade insolvently. This sort of lunacy simply cannot continue long-term, and the very survival of the national game may well depend on more stringent measures being put in place to force clubs to get their houses in order. Cardiff City was firstly a victim of Sam Hammam taking absurd risks with the club’s finances, followed by Peter Ridsdale, who had his priorities all wrong and spent money on the team instead of keeping the tax man and creditors at bay, and the failure to achieve promotion as a result of this only made the situation worse. It’s hard to know what exactly is motivating the Malaysian owners, but the proposals are far too vague for my liking. The change to red means the club’s soul has been lost, quite possibly forever. When you bedeck yourself in a replica, spending 40 quid in the process, ponder this: are the brains behind it conditioning you into a thought system that perhaps you'd not considered? Have you looked more closely at the new England kit for Euro 2012? If you have, I reckon you're helping reclaim English nationalism. The England badge is suddenly red; blue's been removed. If you think that's just a fashion issue, think again. England's identity is now red and white - not red, white and blue. Is this preparation for Scotland's devolution? To create an English identity lost in the fog of a British one for generations? 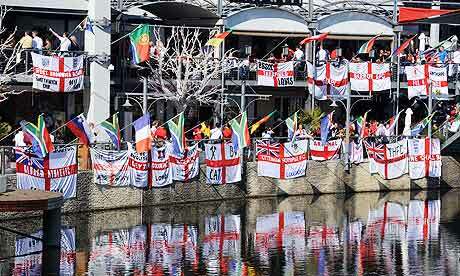 There's moves in the media to superimpose the idea of Englishness on top of Britishness. Programmes about the Church of England and other institutions which are intrinsically different from those north of the border. The Scots have a more a stark tradition in both imagery and belief. Heaven knows what the devolutionists thought of the Diamond Jubilee, but it definitely included Scotland, Mr. Salmond! In football, defining England's been going on for years. 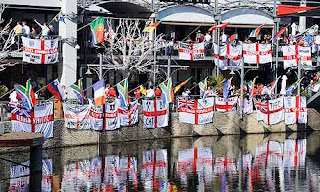 Matchday flags with the pub or football club on the red horizontal banner are on St. George's, 20 years ago, it was ALWAYS the Union Jack. What'll happen to design if the Scots reject devolution? I suppose nothing: the tectonic plates of our Britishness are moving permanently. And if you tell me, "There's no difference between being English and British! ", I say to you, if you've a thick foreign accent, but have the desire to embrace our lifestyle in Leicester, Newcastle or Ipswich, you can be British on day one in a way that truly you could never be English. For me, the English should have a say in the devolution poll. It could have as big an impact south of the border as it would north of it, especially on immigrants. Cardiff City are the Bluebirds no more. From next season, they're red with a new nickname of "The Red Dragons". Research concluded the colour rebrand was essential if they wanted to extend appeal beyond their current fanbase. All this in the year the blues of Chelsea won the Champions League and the FA Cup. Blue is the colour? not anymore in the Welsh capital! And in London, the Arsenal shirt is definitely different from that of Tottenham's. I'm not imagining this, but all over North London, boys from nice homes are wearing Arsenal shirts as an extension of their own aspirations and brand values (with tacit permission of their parents). Arsenal play in a beautiful stadium, they are managed in a continental fashion and have been for a generation and put simply, a Spurs shirt doesn't convey those values at all. Is it to do with Redknapp, their substandard matchbox stadium or even the Tottenham riots? It's a combination of those things that not even a banner of straplines around White Hart Lane's midriff proclaiming To Dare Is To Do and Glory Glory Hallelujah will make a jot of difference to change. 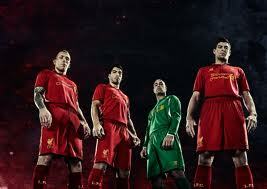 Liverpool FC is brilliant at legendising their brand. Telling the story of Hillsborough and five European Cups is a tip of the hat to the Munich story at Manchester United. Most might say after sacking icon Kenny Dalglish, the sum of their legend is greater than the individual parts. But what can't be denied is that far-flung fans who've never even been to Merseyside eulogise a legend which in reality is little different to that at Aston Villa or Leeds United, just perhaps better narrated to an international audience. I picked up a Manchester United replica in a discount sports shop the other day - and it doesn't half look and feel miles away from the fans who buy it. Literally and geographically. In the seventies, when I wore my Villa shirt, the fabric was made from something I recognised from clothes that mum bought me. These days, not only does the United badge have a trade mark petroleum fuzz, but you get the feeling if you burned it, it'd dissolve into fossil fuel. Next time you look at a shirt, take a closer inspection beyond the tangible: ask yourself, "do I really want to wear all that this represents"?